Washing by hand, when not in a hurry and certainly when clear headed, will always maximise and prolong the structure and clarity of your glass. After drinking, give the glasses a quick rinse to limit the colour leaching into the glass and return to them the next morning. Detergent is only needed to remove fat based residue such as food and lipstick from the glass. Wine does not contain fat, therefore detergent will not help to remove wine stains. Only hot water and a drop of elbow grease is required to remove wine. Never use a detergent containing Bitrex. It is the most bitter substance created by man, designed to protect children from accidental swallowing and is hard to completely rinse from wineglasses when washing by hand. Gentler though no less effective detergents such as Ecover, rinse away well, plus contain little perfume and no Bitrex. Never twist the bowl and stem in opposite directions (like a barman polishing glasses) and try not to exert a strong outwards force on the bowl which risks pulling a piece from it. Cup the bowl as though it were a traditional brandy balloon and use the other hand to clean. A toothbrush is useful to scrub away surface wine stains in the bottom of the bowl above the stem join. Only at the end of the process do you need to polish the stem and foot. Drain the glasses upside down on an absorbent cloth (never put the glasses upside down on a hard surface), and then whilst very slightly damp, use a lint free polishing cloth to polish (without twisting) the bowl, then stem and foot. The finest polishing cloths are available HERE. If not dexterous enough to hand wash, assuming the glasses fit, the dishwasher could be used. The vast majority of wine glasses, from any manufacturer, could be dishwashed. Suitability is as much to do with the way that the machine is maintained and used, as it is to do with the quality of the glasses. The first thing to know is that repeated and lengthy exposure to water draws lead oxide out of the crystalline structure of leaded glass. Therefore, many dishwashes of lead crystal glass will result in a cloudy appearance sooner than non-lead crystal. Never leave lead crystal glasses to soak in water. Limescale, food particles and excessive powder detergent are the real enemies of glass clarity. Hard water will impact glass clarity more quickly than soft water. Once glass has gone cloudy, there is nothing you can do. Either the glass has micro abrasions from repeated machine washing or the lead oxide has leached. Make sure you add salt to your domestic dishwasher as soon as indicated, top up the rinse aid and ensure it is set to the correct level. More is not better…the glasses will show a blue tint. Use a quality tablet or pouch that indicates it is suitable for glass and about once a week use a tablet that actively cleans and descales the machine. Fairy Platinum (not lemon scented) is excellent at this, though the perfume is too strong for frequent fine glass washing. You should see clean shiny steel when looking at the internal back wall of your machine. If it is white/chalky this is a build up of limescale that will scratch glass over time. Always use the quickest setting. ECO is usually the longest setting. Try to wash the glass without putting plates and cutlery in the machine. Do a dedicated glass wash, with the lower rack empty. 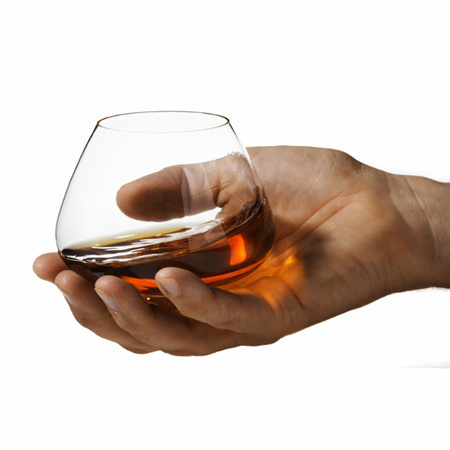 If necessary, polish the glasses without twisting, as above. Professional establishments use dedicated reverse osmosis glass washing machines. The reverse osmosis softens the water thus leaving no water marks on the dry glass. The glasses should always be placed in a rack with individual pockets and not an open wire tray. Zalto use and recommend “Topmatic Crystal Detergent” by Ecolab and their Classic Rinse Aid. Zalto have no vested interest and believe Ecolab offer superior chemical products. Setup of a reverse osmosis glass washer is a science of many variables (sometimes also an art) as there are various criteria to consider (hardness of the mains water, other minerals, temperature which should not be higher than around 60° for final rinse, purity of the final water after filtering + reverse osmosis and detergents / rinse aid.) It is important that the chloride filter is changed as part of the periodic service and maintenance by the engineer (usually every 6 months). Ultra pure water is reactive and can contribute to cloudy glasses after many washes. This is because it causes the minerals in the (crystal) glass to leach out during repeated exposure, making the glass porous. Aggressive detergent can then more easily affect the clarity. The ideal setting/criteria at set-up is 50-70 microsiemens (µS or µƱ )* in order to have no mineral residue and to prevent glass demineralisation. Finally it is worth stating that glass should never be washed with anything but glass in the machine. Grease, citrus and coffee can leave deposits on glass. Lastly, always stick your nose in an empty glass before use. Glasses easily pick up scents from the air, dust, packaging, wooden cupboards etc. A clean glass should have no smell.